Your character's attributes represent his innate characteristics and capabilities: strength, sanity, stamina, knowledge, wisdom, agility, personality, courage, luck, and vitality. Attribute values are quite important, as they systemically affect everything about your character, and each attribute value will affect him in a different way. You can increase the primary attributes through working with a Trainer, or they can be magically increased through spells or items. Attribute values can be as low as 3 points and as high as 25 points. How high and how low your attributes can go is affected by the race of your character. Additionally, each class has a "prime" attribute, one that the class needs most of all in order to learn the skills of that class. Through use of the TRAIN command, you can increase the attributes (strength, intelligence, etc.) or vital statistics (hit points, spell points, stamina) on your character, thus increasing his effectiveness. Training sessions cost practice points. Additionally, there are limits on how much any attribute or vital statistic can be trained, depending on your character's race. You may only train at a designated trainer (sometimes called Guildmasters). These trainers can be found in most major cities and in some remote locations. Strength This is a measure of the brute force one can bring to bear in any given endeavor. It affects how much you can carry, how much damage you do with weapons, and will allow stronger characters to wield heavier armor and weaponry. Knowledge This is a measure of the intelligence of your character. The higher the knowledge of a character, the less effort he or she will need to expend in spell casting and learning new skills. Wisdom This is a measure of the "common sense" of a character. It allows for self-improvement, and in some cases, helps a character resist certain works of deceit. Agility This is a measure of the speed and precision of a character. 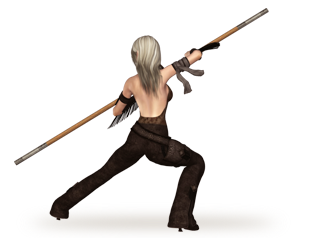 It affects many things, but its affects are most obvious in a combat role, as agile characters are more likely to accurately hit a target, and conversely, cause an opponent to miss them. Personality This is a measure of a character's charm. It is not just a measure of how likable a character is, but helps to measure his or her ability to lead, negotiate, or otherwise interact with other characters. Vitality This is a measure of a character's general health and well-being. More robust characters are able to take more hits in combat, travel farther distances, and tend to need less sleep than normal. Vitality helps in the regeneration of hit points and stamina. Luck This is a measure of how lucky your character is and affects random probability. This attribute is used quite often with just about everything. Courage This is a measure of a character's ability to conquer his or her fear. Some monsters (also known as NPCs, for Non-Player Characters) generate a magical fear which instills a completely irrational terror in nearby living creatures. Courage can help a character override this fear and act normally for a period of time. Courage can also give characters the inner strength to break free of some magical bonds, such as webs. Sanity This is a measure of a character's ability to resist insanity, and his or her ability to control magical forces. Characters with a high sanity characteristically recover from their spellcasting efforts in less time, and can sometimes force a spell to finish regardless of the absence of material components. Hit points, spell power (spell points), and stamina are often referred to as vital statistics. These statistics will all be altered via normal game play and will regenerate regularly as time passes, so long as your character is not hungry or thirsty. Hit Points Hit Points (also known as "hp") is a value that is reflective of how healthy your character is. These points can be used up by receiving damage through combat, magic, and other miscellaneous factors. When your character's hit points drop to zero, he will die. Spell Power Spell power (also known as "spell points" or "sp") is used when your character casts magical spells, uses certain magical or esoteric proficiencies, or makes use of certain magical items. If your character's spell power drops below the amount required for a certain spell, he will be temporarily unable to cast that spell. Stamina Stamina (also known as "st") is used when your character moves - either through combat actions, normal walking, making use of certain magical items, or other miscellaneous actions. You won't see all of these statistics when you are in the process of creating your character, but they are important as you progress in the game and it will be helpful to have some knowledge of them. Some of these attributes will appear under AFFECTS if your character is affected by the Detect Magic spell. Your character advances in power by gaining experience points. Experience points are a way of keeping track of how much your character has learned over the course of his or her lifetime. You can gain experience through combat, completing quests, and other methods. As you gain experience points, your character's overall experience (known as "level") will increase as well. Level is broken up into two values - class level and total level. Your character may gain a maximum of 60 class levels in each class. Total level is the total amount of your class levels. Your character can get up to a maximum of 240 total levels, at which point he will become a Hero, having excelled in the four major adventuring class archetypes (Fighter, Thief, Mage, and Cleric). Beyond that, your character may choose to become an Archon (Level 241), which is a special class available to Heroes. Once your character becomes an Archon, his total level will stop rising and he will be able to gain up to 180 additional class levels for a total of 241 total levels and 241 class levels. Age is the amount of years that have passed since your character was born. Most characters do have lifespans, but since time in Alyria only moves four times faster than real world time, it is unlikely your character will die of old age during your game experience. Alignment is a number that can vary from -1000 to 1000 that describes your character's tendency for good or evil. The lower the number, the more evil your character will be. The higher the number, the more good your character will be. Alignment affects what NPCs may be inclined to attack you, as well as how well you can use certain magical items. Practices are considered the amount of training sessions your character has earned. Your character primarily earns practices through gaining levels, but he can also gain practices through completing quests, performing special tasks, and other methods. Practices are spent when your character wants to learn more about a particular spell or proficiency. Quest points are gained through the completion of quests. The members of the Council of Seven - the Lords and Ladies of Alyria - will allow you to undertake quests in order to gain quest points as well as other rewards, such as practices, gold, experience points, and special items. Quest points can additionally be saved up and used at any quest master to purchase specially items. Gold is used to purchase most goods and services within the world of Alyria from shops, some NPCs, and PCs (Player Characters). You can carry a limited amount of gold on hand before it starts slowing down your movement (this is known as "encumbrance"). You can store extra gold in banks, which can be found in most major townes in Alyria. Reputation is a value that ranges from -100 to 100 and represents your character's notoriety to other PCs. A low reputation score marks your character as someone from which to stay away, and a high reputation score marks your character as a "safer". Reputation is modified in a negative manner when you defeat other PCs in combat and will regenerate very slowly - no more than 12 points in one real-world week. Accuracy is a modifier that affects how effectively your character can hit a target, whether using magic or weapons. It can be easily seen on weapons, as all weapons have a base accuracy modifier. Accuracy affects spells in that it will modify your character's chances of hitting a target with specific spells. Height can be seen when you or someone else LOOKs at your character. This is primarily for roleplaying purposes only. Height is based on race and gender. Equipped Weapon Damage will show up in your character's EQUIPMENT information when he has a weapon equipped. This is an estimate based on how much damage your character can potentially cause to a target that is not wearing any armor or affected by protective spells. Affects are active "conditions" on your character, whether magical or physical. For example, if your character was affected by the "armor" spell that improved his armor resistance, this would be considered an affect. Affects usually, but not always, will wear off after a certain period of time. Your character is comprised of several body parts. While they may not all be called by the same names in all races (and all may not be available to all races), they can be classified into the following categories: head, torso, arms, legs, wings, and tail. Each body part has its own armor resistance, which is a way of measuring how much damage your character can absorb if a hit successfully connects with that body part. The armor resistance is further broken down into four different types, namely armor resistance vs. piercing attacks, armor resistance vs. slashing attacks, armor resistance vs. bashing attacks, and armor resistance vs. exotic attacks (miscellaneous). Each of these armor resistance types will have a value from 0 to 75, where 0 means that there is no resistance to attacks of that type, on through 75, which means that the maximum resistance to attacks of that type is present (75% reduction in damage). Saving throws are the chance that a player has when certain spells and effects are used on the player. There are five different saving throw types, namely saving vs. spells and magic in general, saving vs. petrification, saving vs. paralyzation, saving vs. breath attacks, and saving vs. rods. Saving throws may be modified through certain spells and enchantments on some magical items.